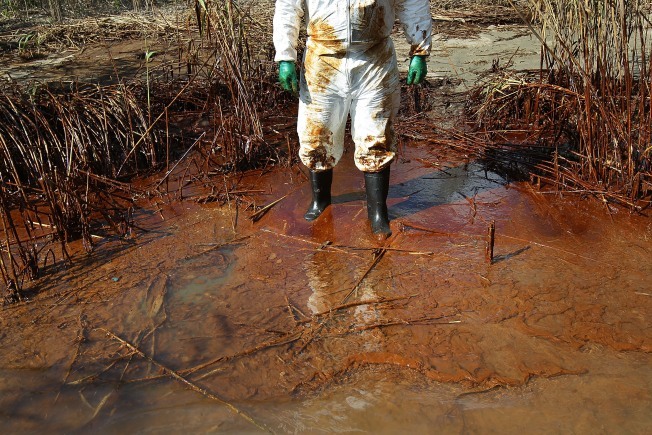 Thousands of spill workers flocking to Louisiana to help clean up the soiled coastline might have more to contend with than just oil slicks and tarballs, health officials say. There are also the snakes. Water moccasins, copperheads, coral snakes and at least three kinds of rattlesnakes could pose threats to the unwary out-of-towners now stomping through the swamps and marshes of the Pelican State, said Dr. Mark Ryan, managing director of the Louisiana Poison Center in Shreveport, La. “We’re seeing a huge number of people who are not accustomed to it,” said Ryan, who included the warning in a health advisory this week. So far, no oil workers have been bitten, but Ryan fears the worst in a state that sees 225 snakebites even in a normal year. Overall in the U.S., between 5,000 and 8,000 people are bitten by snakes and about a dozen die from their injuries. Amid his other spill-related tasks, Ryan has spent the last few weeks trying to make sure Louisiana hospitals have an ample supply of anti-venom in case the need arises. About 70 percent of Louisiana hospitals have enough antidote to treat one serious bite, or about 12 vials, Ryan said. That doesn’t count injuries from the dangerous coral snake, however. The cure for that critter’s venom has been in short supply ever since the drug’s longtime manufacturer, Wyeth Pharmaceuticals, decided to pull the plug on the low-profit product. Pfizer Inc., which bought Wyeth last year, has no plans to start making North American Coral Snake Antivenin again. A Mexican drug manufacturer, Instituto Bioclon, makes an anti-venom, called Coralmyn, but it is not licensed by the U.S. Food and Drug Administration. Remaining coral snake anti-venom supplies are set to expire in October, although the FDA could extend the shelf life. Once it’s all expired or used, coral snake victims will have to take their chances on surviving the venom, which paralyzes nerves and muscles, causing respiratory distress and, sometimes, death. Without the antidote, seriously injured victims who survive will require intubation for several days and suffer weakness for weeks to months. Better, Ryan says, for cleanup crews to use caution and common sense to avoid a bite from a coral snake — or any other kind of snake.